Many marketers have become proponents of programmatic advertising. Marketers spent more then $3.37 billion on programmatic advertising last year. eMarketer is estimating the programmatic advertising will top $9 billion by 2017. Research studies by the Association of National Advertisers and Forrester indicated that only 23% of marketers said they used and understood programmatic advertising and that 26% indicated they understood the concept but needed to learn more about how to apply it to campaigns. Kantar Media defines programmatic advertising as using technology to automate the buying and selling of digital advertising. “Programmatic” has different meanings to different people depending on which side — buyer or seller — of the transaction you are on. The term is founded on an auction concept of buying and selling digital ad space inventory on ad exchanges and networks. Through this automated process, buyers bid for online ad impression through real-time auctions that occur in the time it takes for a webpage to load. 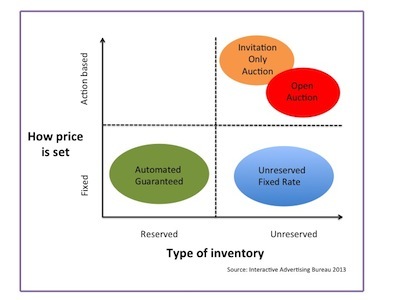 These four types of transactions, based on two criteria, determine how the price is set and what type of inventory is transacted. In its simplest form the process works like this: in the time it takes for an ad impression to load in a user’s web browser, information about the page it is on and the user viewing history is passed to an ad exchange, which auctions it off to the advertiser willing to pay the highest price. The winning bidder’s ad is then loaded into the web page. Advertisers use demand side platforms (DSP) software to purchase advertising in an automated process. DSPs allow advertisers to purchase impressions across a wide range of publisher’s sites, but target specific users based on the geo-location and the users’ previous browsing behavior. Publishers use supply side platforms (SSP) to connect their impression inventory to ad exchanges, DSPs, and ad networks all at once. This allows the publishers to offer their inventory to a large audience and achieve the highest rate possible for the ad impression. If all of this reminds you of a stock exchange high-speed trading desk, you are correct, which is not surprising because most of these platforms are funded by venture capitalists, private equity firms, and publically traded advertising and media companies. ← What’s the most important metric for measuring marketing ROI?